The Detour Lake Mine Project is estimated to cost over C$992m. The construction camp at the Detour Lake Gold Project is being carried by ATCO Structures & Logistics (ASL). The annual production potential of Detour Lake Mine is 650,000oz of gold over a 16-year estimated mine life. A 185km transmission line supplies power to the Detour Lake mine site. The 376km² property lies within the premises of the former Detour Lake mine that was operated between 1983 and 1999 by Placer Dome and produced 1.8 million ounces of gold. The property was acquired by Detour Gold in 2006. At the time of the acquisition, the property contained a near-surface gold resource of 3.4 million ounces. 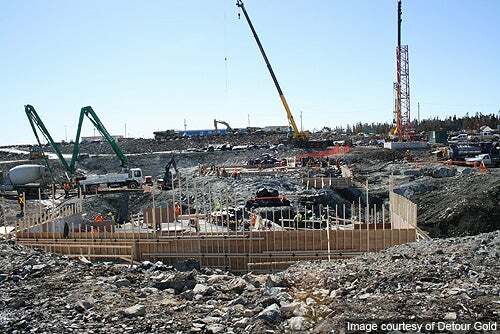 A feasibility study for the development of the mine was completed in May 2010, indicating an annual production potential of 650,000oz of gold over a 21.5-year estimated mine life. Construction on the project began in January 2011 and gold production commenced in February 2013. The project achieved commercial production on August 12, 2013. It produced 75,672oz of gold in the third quarter of 2013. The cost of exploration programme targeting the five high potential target areas of the project increased from $14m to $20m. The construction of the project was completed with a budget of $1.5bn. In February 2011, Caterpillar Financial provided $105m for acquiring the mining equipment provided by Toromont Industries. The Detour Lake mine contains 101.6Mt of proven reserves and 368.4Mt of probable reserves, grading at 1.29g/t Au and 0.96g/t Au respectively at the end of 2011. The net mineral resources have been estimated at 887.3Mt at a cut off grade of 0.5g/t, including 678.8Mt of measured and indicated resources graded at 1g/t Au and 208.5Mt of inferred resources graded at 0.86g/t Au. "The cost of exploration programme targeting the five high potential target areas of the project increased from $14m to $20m." The mine lies within the north-western section of the Abitibi greenstone belt (AGB) in the superior province of the Laurentian plateau, also known as the Canadian Shield. AGB is characterised by several east-west trending synclines of volcanic assemblages and intervening domes of synvolcanic and/or syntectonic plutons. Within the deposit area, supracrustal rocks consist of a thick complex of mafic to ultramafic volcanic rocks known as the Deloro assemblage. The complex occurs in structural contact to the south with the younger aged Porcupine sedimentary assemblage. The contact is defined by a local scale thrust zone known as the Sunday Lake deformation zone (SLDZ). Gold mineralisation is spatially related with the trace of the SLDZ. Mineralisation is hosted primarily towards the north of the SLDZ within its hangingwall, along a 3km strike length within a 200m-wide corridor. It is believed to have concentrated after the tectonic juxtaposition of the Deloro assemblage and porcupine sedimentary assemblage. Within the hangingwall of the SLDZ, mineralisation forms a stockwork of gold-bearing quartz veins that branched out from a flexure coinciding with the northern limb of a shallow west dipping antiform. The second style of mineralisation at Detour Lake is found within the hangingwall of the SLDZ overprinting the early aged auriferous stockwork with low sulphide content. Mineralisation is hosted within broad partially vertical mineralised envelopes in different types of rocks. Sub-parallel to the SLDZ orientation, the mineralisation divides into multiple sub-vertical domains. It is mainly contained in discrete shear-hosted or fault-fill and extensional quartz vein networks and broad mineralised zones that are lithologically controlled and have a weak vein association. The deposit is mined using conventional open pit methods. The mining operation is supported by two 34m³ electric cable shovels, three 28m³ electric hydraulic shovels, six drills, a fleet of 36 haul trucks and a number of other ancillary equipment. "At the time of the acquisition, the property contained a near-surface gold resource of 3.4 million ounces." During the initial three years of operation, approximately 28Mt of lower-grade ore will be stockpiled for process throughout the life of the mine. The open pit has been designed with up to 10m-high benches and a 35m wide haul road at a 10% maximum grade. Processing of ore is done in a typical gravity, cyanidation and CIP (caron-in-pulp) facility with an initial operating capacity of 55,000tps that can be ramped up at a later stage to 61,000tpd. The grinding circuit comprise of two parallel lines, each consisting of a twin semi-autogenous (SAG) mill and a twin pinion ball mill. The mills feature two 7,500kW variable speed drive motors. The larger gyratory crusher and a secondary crushing circuit ensure the supply of higher throughput of fine feed (75mm) to the SAG mill. Additional crushing capacity in the pebble crushing circuit complements this system. Approximately 30% to 40% of gold is recovered in the gravity circuit. The remaining gold in ore is returned to cyanidation and CIP gold recovery. Following carbon stripping, gold will be treated through electro-winning cells before gold pour. To reduce operating costs, the cyanide solution is recycled to the circuit head. The remaining stream is detoxified through an SO2/air system prior to tailing deposition. During the third quarter of 2013, the mill processed 3.88Mt grading at 0.72 g/t. The contract for the procurement, construction and management (PCM) was awarded to AMEC Americas on 30 June 2010. BBA was appointed in early 2010 to provide detailed engineering services for the project. The construction contract for a 185km transmission line to supply power the mine site was awarded to Detour Lake Constructors (DLC) in December 2010. The contract for the supply of equipment including SAG mills, two ball mills and one gyratory crusher was awarded to FLSmidth in May 2010. The contract was valued at C$49m ($48.26m). Maintenance and construction support services were contracted to Moose Cree Services. NAC Wahgoshig Partnership was contracted to provide temporary facilities, maintenance and electrical services, power distribution and services related to plant site excavation, and backfill and heavy civil-concrete works. The contract for the mining camp was awarded to ATCO Structures & Logistics (ASL) in November 2010.